The KW Clubsport 2-way coilovers provide the ideal adjustment range for race tracks such as the Nürburgring Nordschleife and other racing circuits. The KW Clubsport coilovers combine KW's high-end racing technology with maintenance-free KW OEM components and part certificate. This will provide you the ideal product to take full potential of your sports car during track days, sports car driving clinics, enthusiast drives on Grand Prix circuits and on tracks such as the Nürburgring Nordschleife. The KW Clubsport 2-way provides the user numerous adjustment settings. This allows the user to dial the suspension setup to his/hers driving style and to adjust or match the tyre/wheel setup of the vehicle. 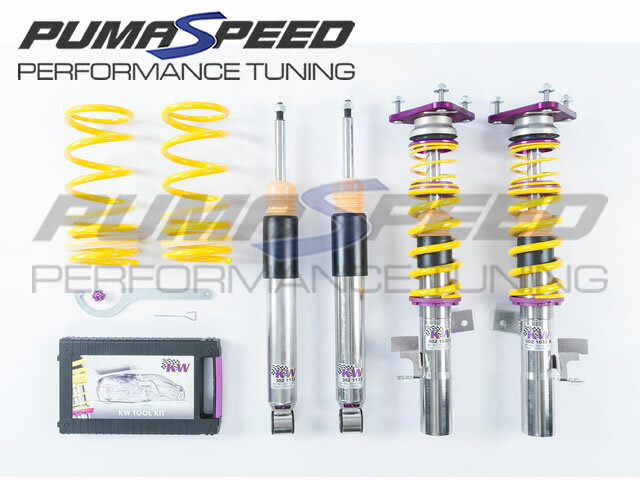 The Pumaspeed Workshop team are ready to fit the KW Clubsport 2 way Coilovers - Focus RS Mk3 in our Head Office located here. Therefore making parts and labour a total cost £2,574.00 (inc. VAT). Pumaspeed have a specialist distribution team that can dispatch the KW Clubsport 2 way Coilovers - Focus RS Mk3 to any destination worldwide.